Metallic will be one of the biggest trends of Fall 2016 but it’s already popular at the moment from clothes to accessories. 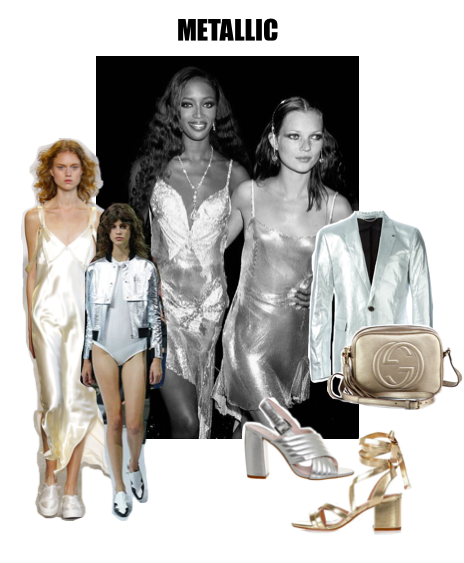 Metallic is playful and great to wear day or night. Put on a nice pair of metallic shoes to brighten up a simple look. The secret is not to overdo it ! Designers like Gucci, Courrèges or Calvin Klein have made bold statements using long metallic pleated skirts and jackets, shiny gold slip dresses, silver shoes and gold bags in their Fall 2016 collections.